And we will end Sportsday there for today. Thanks for joining us and for your comments. Sportsday will return at 08:00 BST on Tuesday. Bye for now. Burnley have tweeted a picture of the open top bus that will be going around the streets later tonight. The players will be presented with the Championship trophy - a night not to miss for Clarets fans. Watch as West Ham boss Slaven Bilic describes the differences between the club's current home at Upton Park and their new ground at the Olympic Stadium. "There will be more people but it is impossible to make a replica of this atmosphere," Bilic tells BBC Sport. "It happens to every club when they move to bigger stadiums - you lose something, because it will be impossible to make the Olympic Stadium a fortress. Here it is intimidating for the away team." Who will finish higher - Man City or Man United? We asked you to vote on which of the Manchester clubs will finish higher in the Premier League table. The results are in, and it is good news for Louis van Gaal's Manchester United side. They will move fourth if they win their game in hand over City when they play at West Ham tomorrow night. We mentioned at 16:15 BST about the potential rise in Chinese football. Well, ex-England boss Sven-Goran Eriksson thinks China could win a World Cup within 20 years. Eriksson, the head coach of leading Chinese Super League team Shanghai SIPG, believes everything is now in place for China to succeed. "This season it's gone crazy, totally crazy," said the Swede. "The president of the country is pushing for football. And if the government push for something in China, things will happen." Some reaction to the news we brought you earlier that Andy Murray will no longer be working with coach Amelie Mauresmo. Patrick Mouratoglou, coach of Serena Williams, said: "To be completely honest I was not surprised because we’ve seen in the last weeks different things that made us suppose that something was wrong." Former Middlesex seam bowler JJ Warr, who played twice for England in the Ashes tour of 1950-51, dies at the age of 88. Leicester fans are still celebrating their Premier League title win but their staff are already been linked with moves elsewhere. But this is not about a player, this is about the boss. 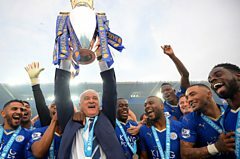 Italian football president Carlo Tavecchio wants Leicester boss Claudio Ranieri to manage the Azzuri to future World Cup Glory. BBC Sport has taken a look at the rise of football in China. Click on the video to watch a fascinating piece on the country that could soon become a superpower in football. In 2006 Tottenham asked the Premier League to order a rematch against West Ham after 10 of their players went down with suspected food poisoning at the team hotel on the morning of the game. An hour ago (14:52), Yorkshire's Joe Root and Jonny Bairstow had put on 200 for the fourth wicket against Surrey. Make that 300. The England duo are crushing the visitors' attack to all parts and eyeing a big first-innings lead. Who will finish higher - Man City or Man Utd? You will have probably seen that we have a vote live. And our question is who out of Manchester City and Manchester United will finish higher in the Premier League? Click at the top of this page on the desktop site or hit the vote button on mobile to have your say. The result will be announced shortly after the vote closes at 16:45 BST. The European Diving Championships begin today marking the start of a week of diving events from the London Aquatics Centre. This evening Team Event final includes the British duo of Georgia Ward and Matthew Lee and all week many hopefuls will be looking to qualify for Rio 2016. Watch the European Diving Championships right here from 19:30 BST. Retiring Leeds Rhinos legend Kevin Sinfield says he would have regretted not testing himself in rugby union. Bath are to sign Northampton Saints' Kahn Fotuali'i, head coach Mike Ford has confirmed. The Samoa scrum-half, 33, has been with Northampton since joining from the Ospreys in 2013 and was part of their Premiership title-winning side in 2014. "I've got another big challenge in front of me and I'm pretty excited about it," he told BBC Radio Northampton. It's not all gloom for the oldies (see 13:55). Former Chelsea front man Eidur Gudjohnsen, 37, has been named in Iceland's squad for Euro 2016. It's a deserved major-tournament reward, 20 years after his international debut. Gudjohnsen now plays for Molde in Norway. We were only expecting a 28-man squad, but with Joe Ledley an injury doubt after going off in Crystal Palace's 2-1 win over Stoke, Chris Coleman has named a 29-man squad for Wales' pre-Euro 2016 training camp. The big news is that Real Madrid forward Gareth Bale has been omitted from the squad. But don't panic Wales fans, Bale's exclusion is because of Real's appearance in the Champions League final. Coleman has until 31 May to name his final 23-man squad for the European Championship. Jermain Defoe's goalscoring exploits this season have handed Sunderland a Premier League lifeline, but can he make a late bid for the England squad for Euro 2016? "I would have to have a word with Jermain about that," said Allardyce. "Has it crossed Roy's mind? I don't know. "His performances and goals this season may have caused Roy to have a little look at him. If he's there, he knows how much experience he has got and can do it at that level. "For the first time for a few years he has consistently played week in, week out and delivered in a position people questioned that he could - as a central striker on his own. "He's done all that in what's been a struggle for us this year. Eighteen goals in all competitions - it's a great credit to him, his dedication and his ability in front of goal." Burnley midfielder Joey Barton is keen to show off the Championship trophy to the fans tonight. Finally. And he was not too impressed with the Football League's decision to not have the trophy present at Burnley's last game away at Charlton on Saturday. The Clarets went into Saturday's game top of the league, but the trophy instead was at the game between second-placed Middlesbrough and third-placed Brighton. We've been talking about celebrations all day, and it is going to be a fun night for Burnley fans as their team gets hold of the Championship trophy with a parade through the town planned as well.